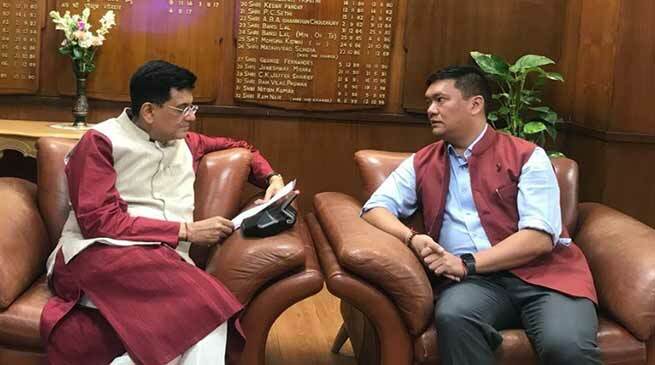 Chief Minister Pema Khandu this evening called on Union Minister for Railways Piyush Goyal here and requested to him expedite the railway projects in Arunachal Pradesh for a robust network of rail connectivity at the earliest. There are eleven railway projects in the state under various stages of implementation. These are, Bhalukpong-Tenga-Tawang, Silapathar- Bame-Aalo (92 Km), Pasighat-Tezu-Parashuramkund-Rupai (225 Km), Itakhola-Seijosa (18 Km), Dumduma-Namsai-Wakro (96 Km), Dangri-Roing (60 Km), Deomali-Naharkatia (20 Km), Lekhapani-Kharsang-Miao-Nampong-New Kamlang (Deban) (75 Km), Tinsukia-Pasighat via Simalguri Kanubari (300 Km), Margehrita-Deomali (31 Km) and Murkongselek-Pasighat (26.15 Km). Of these, survey for the last two projects have been completed while surveys for the rest are to be completed by 2019. The Misamari-Bhalukpong-Tawang line would be one of the toughest and highest in the country. The railway line is expected to include at least 21 bridges and 145 kms of tunnel length. Khandu, while expressing gratitude to the union ministry of defence and railways for the projects, requested the Union Minister to fast-track sanctioning of funds for the survey-completed projects. He also urged the ministry to monitor the survey process so that all are completed as scheduled and construction of the railway lines started soon. The Chief Minister drew attention of Goyal, who also holds the Finance portfolio at the moment, towards the urgent need of an airport in the state and sought early sanction of funds for the Greenfield Airport at Hollongi. Khandu had on Monday met Minister of State for Civil Aviation, Jayant Sinha and discussed the pending issue. Sinha reportedly expressed the ministry’s commitment to develop a robust and expansive aviation network in the North East in accordance with the Prime Minister’s vision of ‘Sab Uden Sab Juden’. Goyal gave the nod of assurance to all the requests and admitted that connectivity is key to all round development of Arunachal Pradesh and that his ministry is committed to assist the state in all possible ways.